Welcome to VHBG’s campus which is nestled in 30+ park-like acres in Henrico County, Virginia. Our therapeutic neighborhood includes all the elements of a safe place to grow … and heal. If you have questions or inquiries about youth placement or referral, please complete our online admissions form and we will respond to you within 24 hours. 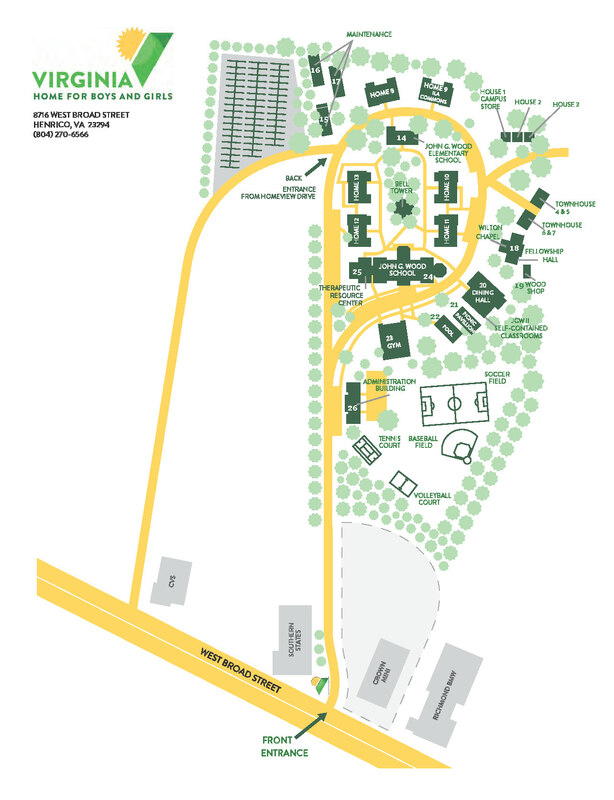 To print a map of our campus, CLICK HERE. If you are interested in investing in VHBG, please join us for a campus tour. We offer tours monthly at 7:30 am and at 12 noon. To schedule a tour, contact Lionel Bacon, Vice President of Philanthropy, at (804) 270-6566 ext 115 at LBacon@vhbg.org. To print a list of philanthropy tour dates, CLICK HERE. If you are interested in referring a youth to VHBG and want to schedule a program specific tour, contact Christopher Campbell, Program Development Manager, at (804) 270-6566, ext 135 or ccampbell@vhbg.org. We understand that seeing is believing and that nothing can offer a better understanding of what we do than seeing us in action. 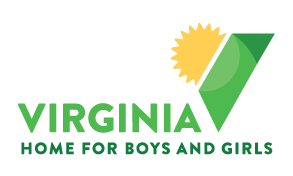 The following directions and map can be used to get to the main campus of Virginia Home for Boys and Girls, located at 8716 W Broad Street, Henrico, VA 23294. From Southside: Take Powhite to I-64 West following signs toward Charlottesville. Take Parham Road North exit. Take the second left on Homeview Drive at Tucker High School. Proceed through the stoplight (crossing Broad Street) until you see the campus. At the STOP sign, turn right and follow the road to the last building on the left. From the Willey Bridge: Continue on Parham Road passing Regency Mall and crossing over the interstate. Take second left on Homeview Drive at Tucker High School. Proceed through the stoplight (crossing Broad Street) until you see the campus. A sign marks the entrance. At the STOP sign, turn right and follow the road to the last building on the left. From West: Take I-64 East to the Parham Road North exit. Turn left at the stoplight. Cross over the interstate and then take the second left on Homeview Drive at Tucker High School. Proceed through the stoplight (crossing Broad Street) until you see the campus. A sign marks the entrance. At the STOP sign, turn right and follow the road to the last building on the left. From north of Richmond: Take I-95 South and take the Parham Road West exit. Proceed to Broad Street and turn right. Stay on Broad – right lane. Turn right after the Richmond BMW car dealer at the Virginia Home for Boys and Girls brick sign. Follow the road into the campus. The Administration Building is the first building on the right. From south of Richmond: Take I-95 North and I-64 West following signs toward Charlottesville. Take Parham Road North exit. Take second left on Homeview Drive at Tucker High School. Proceed through the stoplight (crossing Broad Street) until you see the campus. A sign marks the entrance. At the STOP sign, turn right and follow the road to the last building on the left.